Whilst I'm generally quite good at coming up with cards from my own inspiration, sometimes I need a little help. This card has been cased from a card that my upline, Michelle Last, and when I saw her card I knew I had to give it a go! I put this card together for my monthly card class this month and we had lots of fun creating it. The images have been stamped using Versamark and I have added White Stampin’ Emboss Powder that I have set using a Heat Tool. For the colouring zinhave used Stampin’ Blends to colour the image on the REVERSE side. This gives the subtle effect to your colouring which is the look I was aiming for. Once dry, I have added the Vellum to a Whisper White cardbase using Tombow glue (it dries clear!). 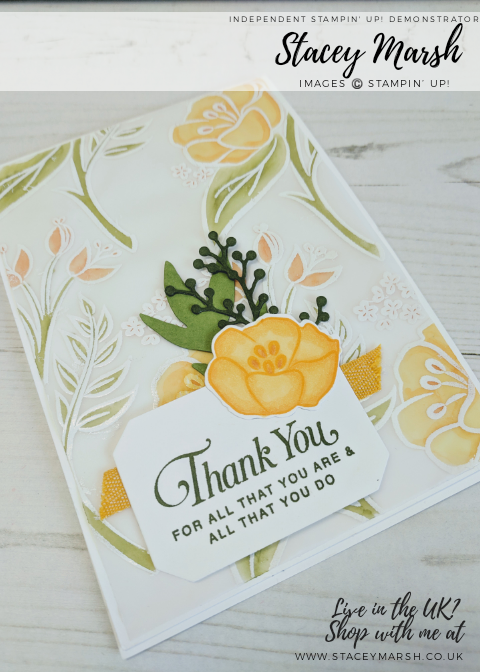 I didn’t want to cover up too much of the design so I opted to use a simple die-cut frame with some die-cut leaves and a strip of Crushed Curry ribbon tucked in behind. 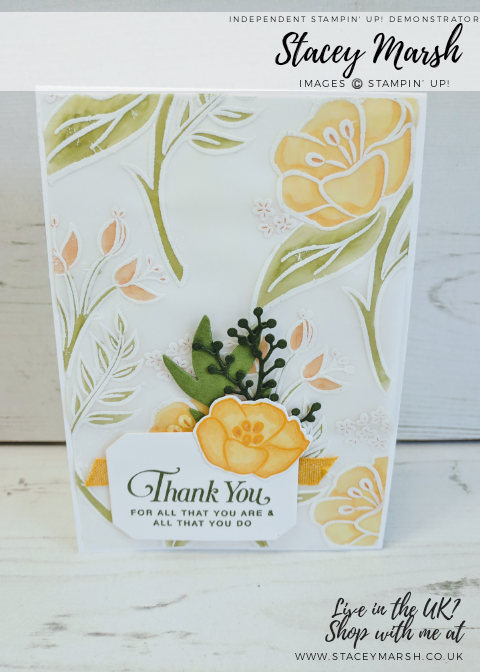 The sentiment comes from the stamp set and to finish I have added a stamped and die-cut flower head! your order, you will still get a gift from me.